‘Is melody, Ned. Is melody for you writing words’. With that introduction in broken English, Tiomkin played his musical theme for High Noon (1952) for lyricist Ned Washington, who then penned the lyrics ‘Do not forsake me, oh my darlin’, on this our wedding day’. The soundtrack—featuring cowboy singer Tex Ritter—plays a complex role, providing a unique single-theme underscore throughout the film. Starring Gary Cooper as town marshal, and the then unknown Grace Kelly as his young Quaker bride, High Noon deals with the ominous arrival of a group of outlaws on the noon train, set against the timeless theme of courage and a man overcoming his own fear. There are no fancy edits in this mythic story, just an endless flow of tense images. The constant tick … tick … tick … of the town’s clock foreshadows the impending doom emphasised by Tiomkin’s music and Washington’s words, ‘Look at that big hand movin’ along, near-in’ high noon!’. 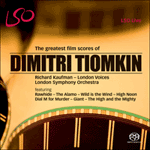 Tiomkin won Oscars for score and song, the latter shared with Washington. It is arguably the composer’s best-known western theme, and one that opened the musical floodgates to the title song as a separate commercial product.